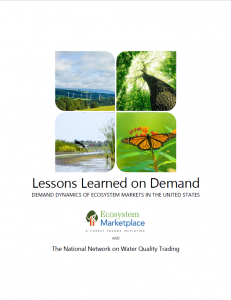 This study on lessons learned about demand in ecosystem markets in the United States was commissioned to help the National Network on Water Quality Trading (NNWQT) identify transferrable lessons for their strategy on stimulating demand for water quality credits and other market-based incentives for nonpoint source water quality. A rapid review of historical experience in ecosystem markets in the United States suggests that across compliance markets, the fundamentals are the same: robust demand requires a co-occurrence of environmental impact, high costs or complexity of alternative compliance options, and a predictable regulatory process. Trading program administrators should also develop a clear understanding of threats to buyer confidence (particularly regarding liability risk and perceptions of market mismanagement) and consider the ways in which regulators are ultimately the gatekeepers of demand in compliance markets. Finally, offering the lowest-cost compliance option is not everything: predictability and simplicity matter too, and for some buyers, the broad benefits of restoration and conservation to their local environment and community are ultimately more important than credit price.